The World within the Mind presents us with teachings on non-duality and the way to realization, in the form of discourses given by a traditional teacher, the sage Vasishta, to his pupil, the righteous Prince Rama. It is no fault of the educated if they are doubtful of something until it is explained to them to their satisfaction, as in the case of Prince Rama. But the half-educated are not fit to receive spiritual instruction, because their view of the visible world, which is concerned only with immediate objects, proves the cause of their ruin. He who has come to behold the transcendental light, and has a clear insight into spiritual truths, feels no desire for sensual enjoyments; in the course of time he comes to the conclusion that Brahman is all in all. The disciple is to be first prepared and purified through meditation, devotion and the service of the Yoga, and by daily practice of tranquillity and self-control, and is then slowly initiated into the conviction Kham Brahman. Vasishtha then said: “I will tell you, O Rama, at the conclusion of these discourses, whether the dross of gross bodies is attributable to Brahman or not. For the present, know that Brahman is almighty, all-pervading and is Himself all, in the same sense as magicians, by various practices, produce many things m the sight of men which are unreal appearances. Whatever happens, in any form or at any time or place, is but a variation of the One self-existent Reality. Surely then, O Rama, you should but wonder at any change in time and place, which is full of’ the spirit of God and exhibits the endless aspect of the Infinite. The mind of one who sees God in all and is firm in equanimity, has no cause to fluctuate at any change in nature, or vicissitude of fortune. The Lord manifests the powers seated within Himself, as the sea manifests the waves within itself. The world appearing around it is as the light of Atman. The minds of men are endowed with this knowledge at their very birth. Then, growing by degrees, they spread themselves out in the course of time in the form of this spacious forest of the world. Know, O Rama-ji, that although it is commonly said, in speaking of it ‘All this is made by, or comes from, God, it is not really so in the spiritual sense. No change or partition and no relation of space or time bear any reference to the Supreme, Who is immutable, infinite and eternal; nor is there any appearance or disappearance of Him. The mind, by reason of its birth from Him, is possessed of both the power and intelligence of His intellect, and by intense application is enabled to accomplish its intended purpose. To say that one flame of a fire is the product of another is quibbling and there is no truth in the assertion. It is not a product, but the very thing. That one is the producer of another is also a fallacy, because the one Brahman, being infinite, could produce no thing other than Himself. Brahman is the intellect (buddhi). Brahman is the mind (manas) . He is intelligence (chit) . The whole universe is Brahman, yet He is beyond all this. In reality the world is a non-entity, for all is Brahman alone. 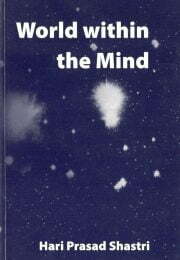 The World within the Mind can be read as an accessible introduction to one of the great metaphysical classics of world literature. For committed students of non-duality the World within the Mind would be a good book to read carefully during dedicated study time.